Peter Woulfe (1727 – 1803) was an Irish chemist and mineralogist. He first had the idea that wolframite might contain a previously undiscovered element (tungsten). In 1771, Woulfe reported the formation of a yellow dye when indigo was treated with nitric acid. Later it was discovered by others that he had formed picric acid, which eventually was used as the first synthetic dye, an explosive and an antiseptic treatment for burns. Woulfe is credited with inventing, ca. 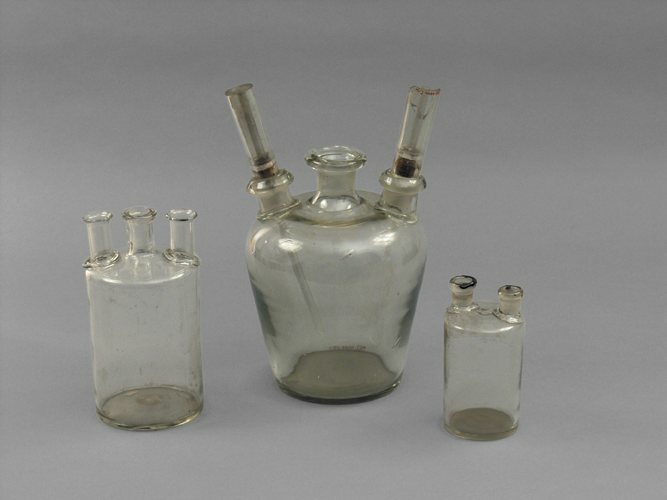 1767, the Woulfe Bottle, an apparatus for purifying or dissolving gases, which employed a bottle with two or three necks. "The last true believer in alchemy was not Dr. Price, but Peter Woulfe, the eminent chemist, and Fellow of the Royal Society, and who made experiments to show the nature of mosaic gold [ tin(IV) sulfide, SnS2]. […] He had long vainly searched for the Elixir, and attributed his repeated failures to the want of due preparation by pious and charitable acts. I understand that some of his apparatus is still extant, upon which are supplications for success and for the welfare of the adepts." Timbs, John (1866). English Eccentrics and Eccentricities. vol.1. [S.l. ]: Chatto & Windus. OCLC 500018598. Woulfe, Peter (1771). "A method of dying wool and silk, of a yellow colour, with indigo; and also with several other blue and red colouring substances". Philosophical Transactions of the Royal Society of London. 61: 127–130. Hartog, Philip Joseph (1885–1900). "Woulfe, Peter". Dictionary of National Biography. vol. 63. London, England: Smith, Elder & Co. p. 64. Woulfe, Peter (1767). "Experiments on the distillation of acids, volatile alkalies, &c. shewing how they mayt be condensed without loss, and how thereby we may avoid disagreeable and noxious fumes: in a letter from Mr. Peter Woulfe, F.R.S. to John Ellis, Esq. ; F.R.S." Philosophical Transactions of the Royal Society of London. 57: 517–536. Bibcode:1767RSPT...57..517W. doi:10.1098/rstl.1767.0052. "Woulfe, Peter", Dictionary of National Biography, 1885-1900, 63 : 63–64. ^ Timbs, John (1866). English Eccentrics and Eccentricities. vol. 1. London, England: Richard Bentley. pp. 136–137. Picric acid is an organic compound with the formula (O2N)3C6H2OH. Its IUPAC name is 2,4,6-trinitrophenol (TNP). The name "picric" comes from the Greek πικρός (pikros), meaning "bitter", reflecting its bitter taste. It is one of the most acidic phenols. Like other highly nitrated organic compounds, picric acid is an explosive, hence its primary use. It has also been used in medicine (antiseptic, burn treatments) and dyes. Johann Friedrich Wilhelm Adolf von Baeyer was a German chemist who synthesised indigo, developed a nomenclature for cyclic compounds. He was ennobled in the Kingdom of Bavaria in 1885 and was the 1905 recipient of the Nobel Prize in Chemistry. William Thomas Brande FRS FRSE was an English chemist. Dr. Charles Balguy was an English physician and translator. The Wyon family was an English family of traditional dye-engravers and medallists, many of whom went on to work in prominent roles at the Royal Mint or as engravers in a family die business. Starting from Peter George (II) Wyon who migrated to England from Cologne, Germany many subsequent descendants of have made notable contribution to British numismatics. Over the course of the 19th century two member of the family became chief engraver at the Royal Mint with many more involved in coin design.